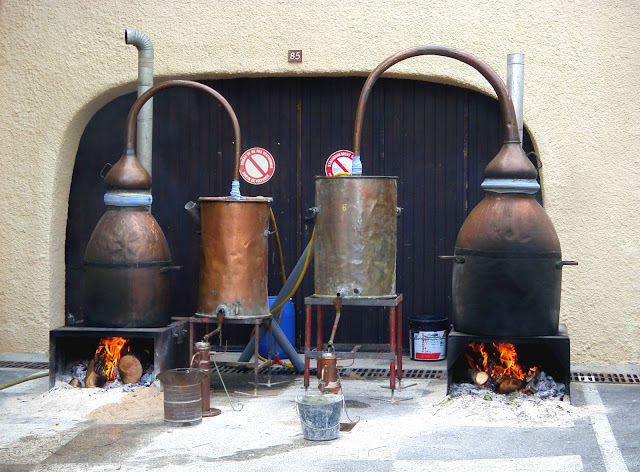 In the main photo, we see the two 400-year old lavender stills (alambic in French). The still on the right makes double the amount of lavender oil to the one on the left. 120 kilos of the cut and dried lavender + 70 litres of water goes into the still. It's sealed tightly with the 'blue band' and the fire is lit. With heat comes condensation. Vapour from the lavender rises into a coil tube, which is cooled by water. 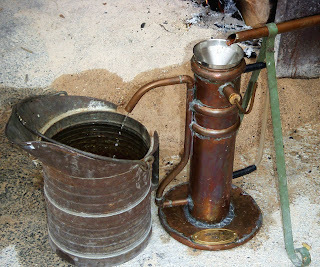 It condenses again and is recuperated through a separator (1st small photo) producing essential oil and distilled water. When 40 litres of distilled water is collected, the lavender is exhausted and needs replenishing, otherwise it starts to burn. Approx 250 mls is yielded from 120 kilos of wild lavender. (1000 kilos of lavender yields 2 litres of wild lavender oil.) Wild lavender oil is more expensive than cultivated oil. 10 ml sells for €5.00. It's considered to be far stronger and is used for medicinal and culinary purposes. 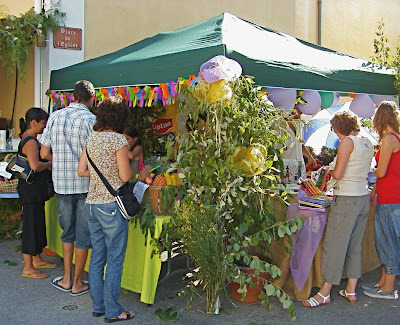 In the 3rd smaller pic we see the oil being bottled and finally, the village stall where it is sold at the Fête de Lavande. Please click on any of the photos to enlarge. Thanks so much to my friend Anita, who lives in Sainte Agnès and took all the photographs and also provided such an easy explanation. If you missed Anita's photograph of Julien harvesting the lavender please see yesterday's post or click on the link. You can also read of the charming little house that Anita has for holiday rentals in Sainte Agnès - ideal for visitors to Menton who would like to stay in a medieval hill village. Note: I've posted more photos than usual today but it seemed necessary to explain the process. The equipment and the process and your pictures are absolutely fascinating!! I had no idea how the oil is made. The old ways still work best, and so picturesque! I was so curious about this process and the alambics are not much different from the ones a young alcohol bootlegger I know used long time ago for less aromatic purposes. Beautiful set of photos and great post. Wow... that's how they make lavender oil!? Very interesting posting! I guess the lavender oil must be quite expensive after such a process, non? Great photos in a fun series! Thank you, Anita. 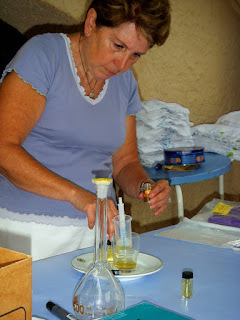 Thank you, Jilly for bringing us the magic of distilling lavender oil. Beautiful shots. Clear explanations. I wonder, is there the smell of lavender being released during the process or is it truly sealed in with the blue tape? Wow! Thank you for this great expose on the making of lavender oil, a truly precious commodity. And a quintessential essence of the southern French elan! Wow, this was fascinating! I had never heard of lavender oil before. The aroma in the distillery must be overpowering: death by sweet perfume. Do they make lavender liqueur? I first thought it was a still for alcohol too. It sounds like a pretty interesting process and quite involved to get the oil. Thanks for the detailed description and photos of how this is done. Could have never imagined of just how you make lavender oil. Snapshutter, the alcohol stills look exactly the same. 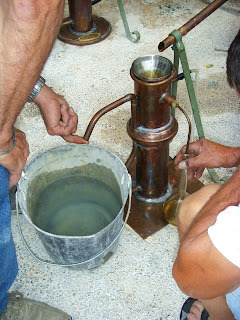 There are two in Gorbio used to make the 'branda' or marc (eau de vie) as it's called. So you are right. The blue band is a wrap around the joints in the 'machinery' to seal in the vapour as the steam condenses. There is very little smell around the stills, but once the distilled water and oil are taken off through the separator then the smell is pretty heady! Also the cut lavender waiting to be put in the still is lying close by. When the lavender was laid out in the Salle de Fetes for the preceeding week the smell was almost over powering! Lavender is my cure all. From cold sores to migraines I will reach for this. Very interesting to see the preparation, now if I just had smellivision.